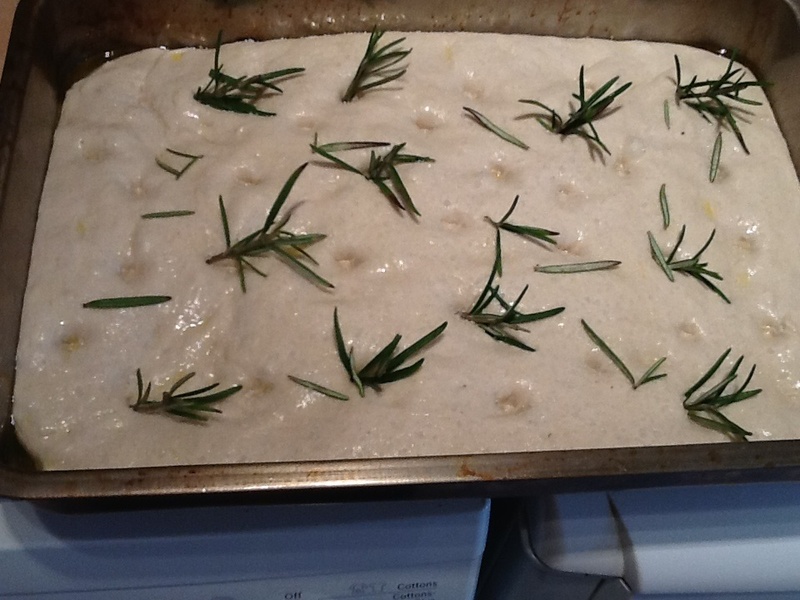 I had tried Focaccia once before at home but I found it too dense so was glad to have another try at Bread Club and it was a much better looking and tasting result. 2. Add the flour and mix until no dry flour remains at the bottom of the bowl. It will be a fairly sticky mixture. Cover and leave for 10 minutes. 3. Add the salt and fold until smooth – about 30 times. Cover and leave for 10 minutes. 4. Add the oil and fold again For 10 minutes then shape into a round – coat lightly with oil – cover and leave until doubled in size. 5. Tip onto an oiled surface and press into a rough rectangle before placing in an oiled baking tray (approx 26 x 36cm) and pushing right into the corners and leave to rise for 30 minutes. 6. 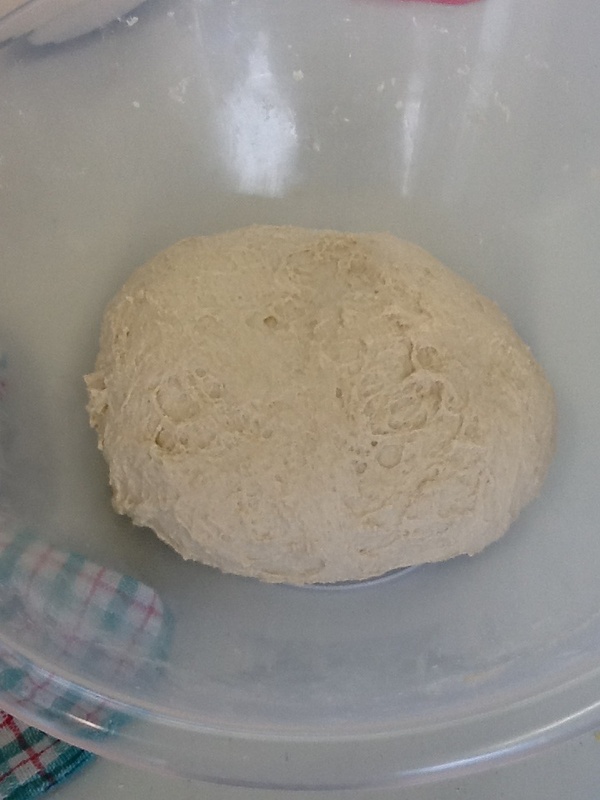 Heat the oven to 250 C. When the bread looks puffed up and airy use your fingers to press deep holes into the bread. 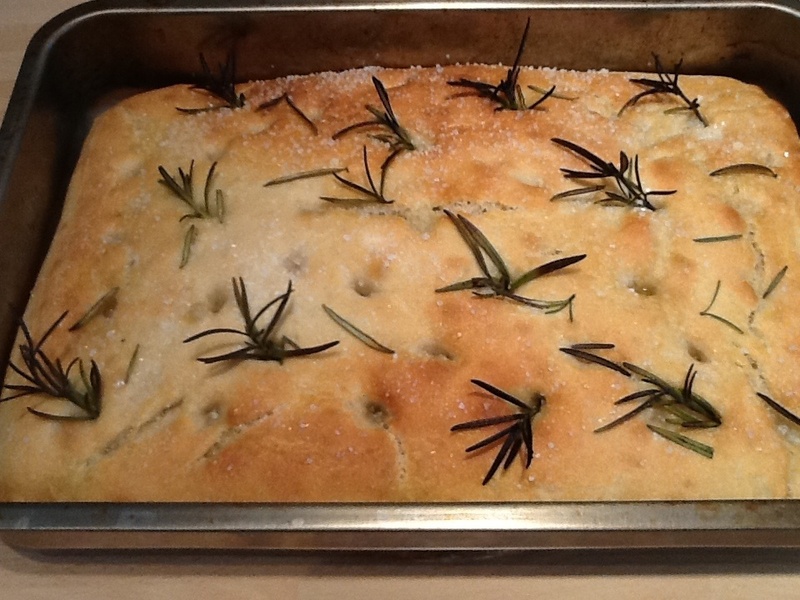 Drizzle with more olive oil and dress with rosemary leaves and flaky sea salt or topping of your choice. 7. Bake for 10 minutes before turning the oven down to 200 C for a further 10 minutes. Cool on a wire rack. 8. Best eaten warm but when cold can be split and toasted and filled with green olive tapenade and slices of cheese or filling of your choice! Thank you – just doing another brioche it was so nice!